Majority of those whose work involves the computer can tell that many folders in one directory can be a problem, especially when it comes to searching for a particular folder in a hurry. Why? The answer is simple – you cannot tell the folders apart because they all look same yellow. In many cases, having customized folders (color-coded or folders with some image on) makes it much easier to find the needed one and tell what’s in the folder. If you have Microsoft Windows, you already have a way to change a folder icon with the one from the default set that comes with Windows but there are two "buts" here. The first is that as it is with any default set of something, there is not much choice. The second "but" is the time you are going to spend to change a folder icon. Basically it’ll take you 8 steps to change one folder icon. Whew! At last we got it: changed the folder icon. As a technical writer, I create lots of documents and lots more folders. Over the years my computer has accumulated thousands of them and for a long time I wished I could customize folders to tell them apart. So, I used the default set of folder icons to customize specific folders and that "change-folder-icon-in-eight-steps" method I described above. However not long ago I found a better solution. It’s named Folder Marker and it tackles the too-many-folders problem in a more elegant manner than Windows tools. I find Folder Marker very useful in many ways. Mostly it helps me to prioritize project folders. Depending on the working status and project completeness, I can customize folders as ‘Half-Done Work’, ‘Done Work’, ‘Approved’ and ‘Pending’. Besides, I often use ‘Normal Priority’ icon to mark folders that do not require my immediate attention, ‘High Priority’ icon to customize folders that need to be done soon because the deadline is coming. For projects that can wait for a longer time, I use ‘Low Priority’ icon. These priority labeled folders help me get organized and deliver projects on time. In addition to applying Priority icons to folders, I often use color-coded folder icons. They also help me customize folders to make them easier to find and see what’s inside. The logic behind the colors can be anything you want. For example, I share my computer with a colleague and in the past, we often deleted each other’s documents by mistake. Now I mark my folders red, she marks her own folders green and we can conveniently share one computer because we know that this folder belongs to me and that one belongs to my colleague. Customized folders can help you organize work on a computer you share with somebody else. Folder Marker provides me with a great choice of folder icons to choose from. The default set can be expanded and I can add my own icons I found on the Web. There is another lovely feature in the program that I often use. Sometimes I have to move documents onto my laptop when I am going away. I save customized folders to my USB drive and the wonderful thing is that they do not change their look. 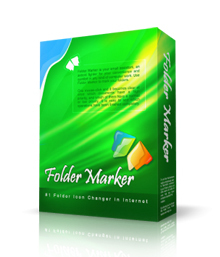 That’s because Folder Marker can make customized folder icons portable. So when I start my laptop, I see the same folders with the same icons as if it were my desktop computer! Folder Marker is a little cute application that’s worth its virtual weight in the agony and frustration when you are looking for a particular folder and cannot find it because you see literally a jungle of yellow folders. I found myself changing folder icons for more meaningful and prominent ones just because Folder Marker made it such fun.